The Edifier MP100 speaker is a fully featured ultra portable Bluetooth speaker, compatible with Bluetooth 4.0 technology and microSD functionality, gives you multiple ways to play your favourite tracks. The battery offers up to 20 hours of use, take the MP100 anywhere with its dust proof and splash proof exterior. This small but powerful speaker also acts as a speakerphone for answering calls. Made for the adventurous type, it is ultra-portable and rugged, the clip at the top is made to clip onto your belt or backpack. Built-in proprietary skin cavity suspension technology, smaller vibration damping, brings an amazing amount of low-frequency sense. Uses class D amplifier, which is very efficient and has a palm-sized sound system, it has a 4.5W non-distortion power. ● Silicone jacket, symbolic button, crystal texture packaging, full of quality taste. Adopts Bluetooth 4.0 technology, which can transmit farther, connect faster, and consume less power. Powered by a high-quality lithium battery, fully charged and played at medium volume for up to 10 hours. Small three defensed - waterproof, dustproof and shockproof, small wind and rain or splash of water can still make it sing loudly without any worry. Compatible with many devices such as smartphones and laptops. 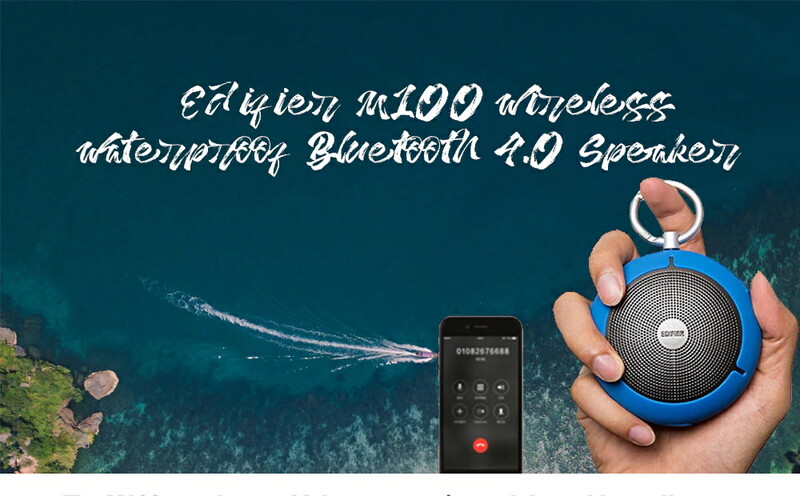 Using Bluetooth 4.0, connecting it to your smartphone, whether it is an iPhone, Android, or Windows phone you can use the MP100 as a speakerphone so you can take calls hands free.